For Jed York, saying the right thing has never been a problem. It's been following through on those statements that's been the issue. 49ers CEO Jed York to hit the reset button on his stumbling franchise Sunday. Is Vance McDonald worth $35 million extension from the 49ers? In the snowy confines of Soldier Field, the 49ers seemed frozen in place during a listless 26-6 loss to the Chicago Bears Sunday. With each game, Colin Kaepernick has been getting better and better in Chip Kelly's system. One yard was the difference Sunday, enough to land the 2016 San Francisco 49ers on the wrong side of franchise history. The only thing recognizable about the 49ers on Sunday was that they suffered a 23-20 loss to the Arizona Cardinals. Cardinals running back David Johnson is arguably the best in the NFL, and the 49ers run defense is clearly the worst. Carlos Hyde will not play versus the Buccaneers, opening the door for Mike Davis and Shaun Draughn. Colin Kaepernick's restructured 49ers contract removes his injury guarantee, as well as the deal's final four years. Colin Kaepernick has regained his starting quarterback role over the struggling Blaine Gabbert. The former first-round pick spurned the 49ers for the second time in as many seasons, choosing to retire yet again. Though the 49ers aren't a powerhouse anymore, they're still competition for Seattle. Their offensive line may give the 49ers an edge in the run game during Monday night's contest. Colin Kaepernick's biggest fight during Thursday night's 31-21 defeat of the San Diego Chargers was securing a spot on the 49ers roster. 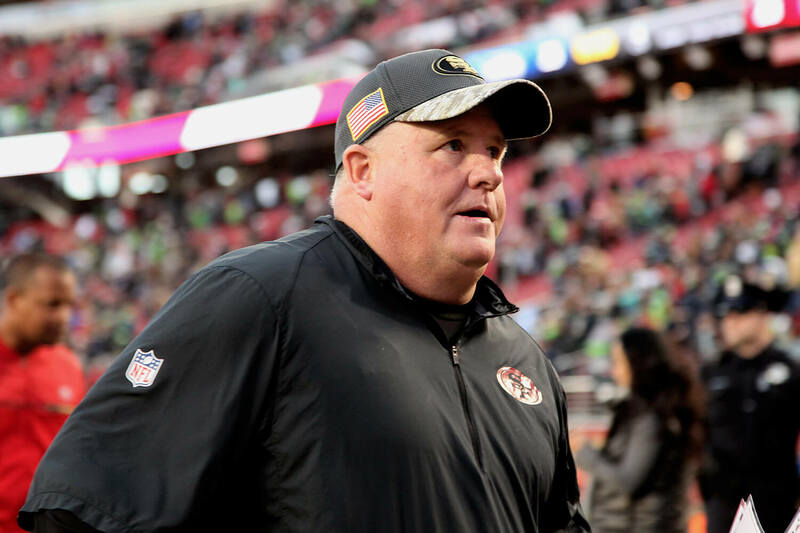 49ers head coach Chip Kelly looked to defuse any notion of internal strife during a conference call with reporters. Chip Kelly's up-tempo offense struggled to find its footing under QB Blaine Gabbert Sunday. Through the rise and ruin of the San Francisco 49ers offense, tackle Joe Staley has stood as a pillar of strength. The transition into the NFL hasn't been the smoothest for 49ers first-round draft pick Joshua Garnett.. The hiring of former 49ers personnel executive Tom Gamble could be seen as an ominous sign for general manager Trent Baalke. The 49ers, Trent Baalke, and Colin Kaepernick have reached the point of no return.